since his return to the British Championship, Max Anstie would face some tough competition from his GP rival and fellow sand-extraordinaire Jeffrey Herlings. Although not able to beat “the bullit” Anstie was leaps and bounds ahead of the rest of the field and kept the dutchman on his toes throughout the day. In the first race Anstie holeshot with his Cosworth Powered DRT Kawasaki, but was then passed by Herlings. Anstie took this oppurtunity to chase his fellow Grand Prix rider for a few laps until easing off and settling for second position. Race 2 saw the Brit take a 5 second lead over Jeffrey, although this was in vain as Herlings once again passed in the second lap and finished in a similar manner to the first race. It was the Dutchman’s turn to holeshot in race three, with Anstie hot on his heels for a few laps once more. Having to consider the whole championship, Anstie once again settled for 2nd in the race and therefore the round, not wanting to risk any unnecessary moves. In short both Anstie and Herlings were way faster than the rest of the field, and despite Max’s best efforts he was unable to answer to the “worlds fastest sand rider” who was riding as a guest at the 4th round of the British Championship. 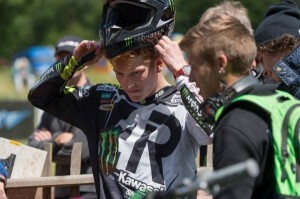 This entry was posted in Home and tagged 2015, bike it, cosworth, fim, hawkstone park, Jeffrey Herlings, kawasaki, max anstie, motocross, mx2, steve dixon, youthstream on 12 June 2015 by admin.